Wood pellet grills continue to grow in popularity. Some are very utilitarian and the design visually reflects this. The Memphis Grill recognizes that a wood pellet grill is a serious investment, and you want to see quality materials and design throughout. 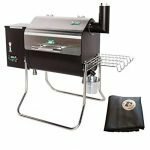 Their VG0002S Elite Wood Fire Pellet Smoker Grill is meant to be the top of the line in free standing wood pellet smokers. It is made from 304 stainless steel throughout, for maximum rust and corrosion resistance. This also gives it a special gleam on your deck that is sure to be a conversation starter with all your dinner guests. The grill grates match the gleam of the exterior. They are made from heavy-duty steel, then specially plated with nickel, which also provides some non-stick qualities. The Memphis Grills Elite also has a staggering 24-pound maximum capacity hopper. When fully loaded and the heat is dialed in the dual combustion fans and auger can run for up to 62-hours. It also comes with an internal temperature probe, that can be linked via a WiFi signal to your phone. This requires you to download a special app, available through Apple IOS as well as Android. Memphis Grills cut no corners in the design and materials used in the Elite wood pellet grill. The 304 stainless steel throughout is a really nice touch. This grade of stainless steel contains between 18 to 20% chromium, as well as 8 to 10.5% nickel. This gives the grill a fetching gleam, while also providing you with superior rust and corrosion resistance. All the welds and fasteners are of high quality and performed by skilled manufacturers. The dual combustion fans ensure efficient heating and heat distribution. The grill grates are made from steel, then carefully electroplated with nickel to impart non-stick properties. These features and the optional broiler plate all speak to this grills status as being “Elite” in its category. As you might imagine, there is a great deal of assembly that goes into the Elite. Still, the designers took the time to make sure the instructions were easy to read. It’s a good idea to recruit a friend or two to help, as some of the pieces are a little large and awkward to hold on your own while you fasten them. With some basic tools, you should be able to get it together in one and a half to two hours. 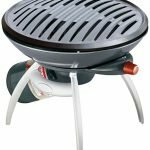 The Memphis Grills Elite will do everything you expect in a wood pellet grill, and more. The optional broiler plate means that you can use it from traditional direct heat grilling. At full flame, it can even produce a truly steakhouse quality sear. The Elite also has the widest temperature range in the Memphis Grills line. When dialed in, it can go as low as 180-degrees. Yet when it’s turned up to full flame and given 20 to 30 minutes to preheat it can get as hot as 700-degrees Fahrenheit. Just like most wood pellet smokers, the Elite tends to produce the most smoke at lower temperatures. If you want to smoke a large fatty piece of meat like a pork shoulder or a brisket, you could dial it down to the lowest heat setting for the first two or three hours. This will help to deeply infuse the smoky flavor into the fat layers that will start to render down into the meat. You can then turn the temperature up to the 225 to 250-degree range. To use the broiler plate, direct heat option, you will need to set it up in advance. If you want to switch back to using it as a smoker, you will have to manipulate the grates. This is a common issue with most wood pellet grill broiler plates. A welding glove is better than an oven mitt for doing this. Right out of the box the Memphis Grills Elite provides you with an enormous 844 square inches of grilling space. This is enough to prepare competition level barbecue for a large number of people. If for some reason you need more there are accessory grates available for sale. The broiler plate option gives you the ability to use the Elite just like you would a traditional direct heat charcoal grill. The WiFi controls linked to the internal probe helps you keep close tabs on the meat being cooked and the temperature of the smoke. It runs through an app that’s available for Apple IOS as well as Android. 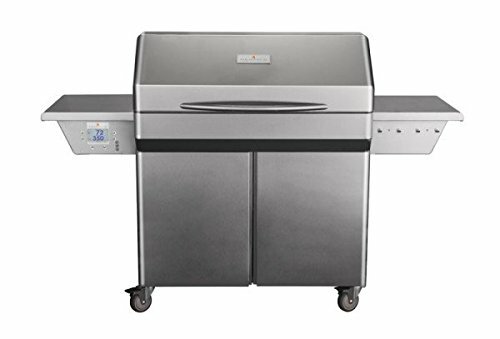 The Memphis Grills Elite is relatively easy to clean, the ash cleanout and grease management systems are easy to use. The nickel-plated grill grates just need to be scraped down with a nylon bristled grill brush. Try to avoid wire bristle brushes as they can gradually start to scrape and texture the nickel plating, which could affect their nonstick properties. 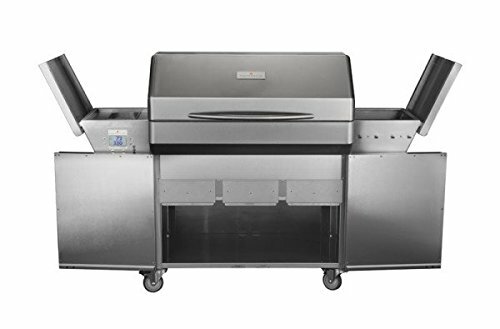 Like all grills in this line, the Memphis Grills Elite comes with a seven-year Limited Warranty against defects in material and workmanship. Electrical components carry a three-year replacement warranty when subjected to normal use. The limited warranty does not extend to the fire pot, meat probe, which have a 30-day warranty. This level of warranty is a step better than what their competitors offer. If you are looking for a truly high-end wood pellet grill that doesn’t look like all the rest, then you should give the Memphis Grills Elite some serious consideration. It has everything you would expect in a premium or “Elite” wood pellet grill, while also throwing in some versatile extras.